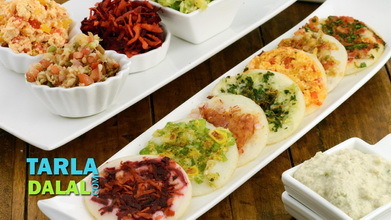 Uttapam Sandwich Video. 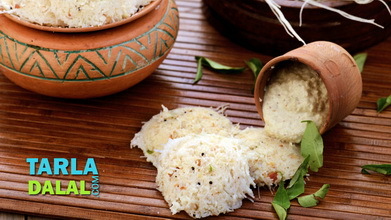 An uttapa with a difference! 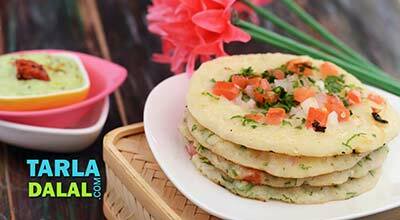 The spread-out batter is topped with veggies and coated with another layer of batter, to make a sandwich, which is then cut into equal wedges and served hot with the typical South Indian accompaniments. 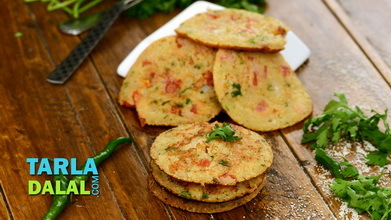 To make the uttapam sandwich , heat a non-stick tava (griddle) and grease it with ½ tsp of butter. 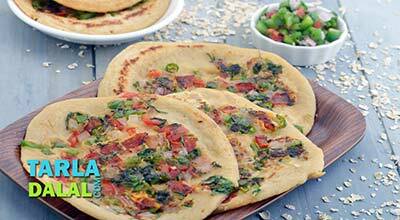 Sprinkle little water on the tava (griddle) and wipe it using a clean muslin cloth. 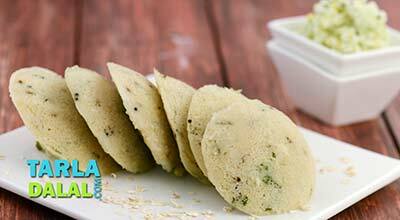 Pour ½ cup of the dosa batter on the non-stick tava (griddle) and spread it in a circular motion to make a 175 mm. 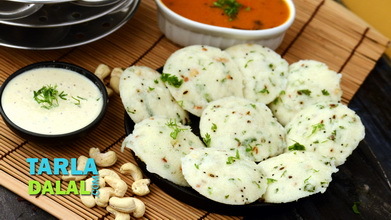 (7") thick uttapa. Cook for 30 seconds and spread 2 tsp of green chutney and 2 tsp of red chutney evenly over it. Spread 1 tsp of butter evenly over it. Spread ¼ cup of onions, ¼ cup of tomatoes, ¼ cup of capsicum, ¼ tsp of garam masala, ½ tsp of chilli powder and little salt evenly over it and press it lightly using a spatula. Cook on a medium flame for 2 to 3 minutes. Pour ? cup of batter over the vegetables, spread it evenly using a big spoon to make a thin even layer. Turnover, tap gently and cook on a medium flame for 3 to 4 minutes. Trim off the extra batter and vegetables from the circumference to get a neat circular shape. Turnover once again and again cook on a medium flame for 1 minute. Spread 1 tsp of butter evenly over it, turn over and cook on a medium flame for another 1 minute. Finally turn and cut into 6 equal pieces. 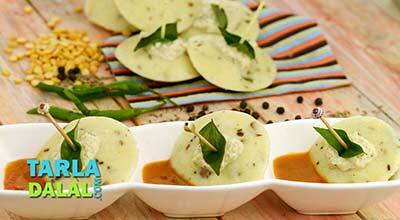 Serve uttapam sandwich immediately garnished with ¼ cup of cheese. 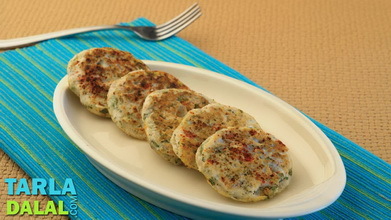 Repeat steps 2 to 15 to make 3 more uttapam sandwich.